The wings were delicious! I was extremely satisfied at the taste, size of the wings and the service i received. However, that was back in the summer time (it is now end of October), and I have been looking for the truck ever since then. They rarely tweet and are never around when I am in the mood for some great wings. I would like to see/hear more of them. Especially around the L'Enfant/ Mandarin Hotel area. Great wings, just rarely available. The flavor of the honey bbq wings was good, however they were undercooked. There was frest blood at the bone. Other employees in One Judiciary Square complained of the same thing. Additionally, when I went to use one of the napkins I found blood on the napkin. After inspecting the container and bag, I found more blood that indicated someone had cut themselves. Needless to say, I'm praying there is no outcome but I threw the last 6 wings in the trash. I will be spreading the word!! 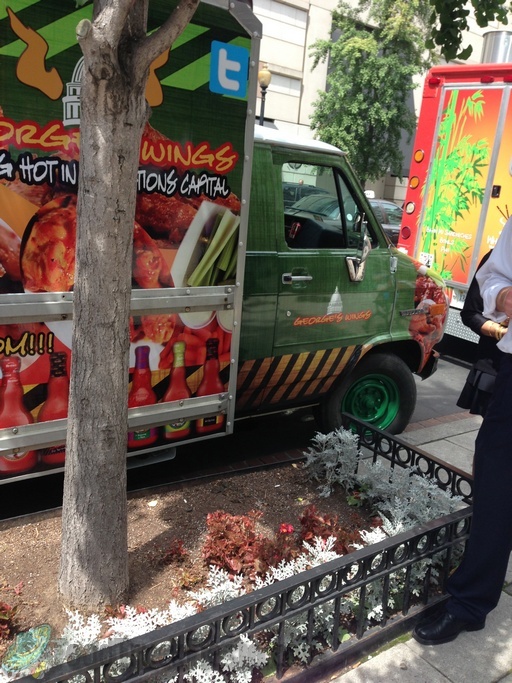 Seen this truck at metro center was surprised that there was only one buffalo wings truck in dc! The service was great they allowed me to choose different sauces and did not charge me for extra ranch dressing I had half BBQ half mild it was actually pretty good an comes with plenty of sauce!!! Wings were well seasoned and so was the fries!!!! Wings are baked not fried and seem old. Blue cheese dipping sauce looked gross. Fries were pretty good. Will not be back! Just tried there wings!!! The spicy BBQ was amazing and the fries come seasoned!! Def will be back!!!! This truck needs to be on the list so that customers can see where they are. I only have a hour for lunch, and being able to use this website pinpoint this truck's location would save me alot of time. PS I understand this truck is fairly new so hopefully they will get on board with the food truck map real soon. The teriyaki wings weere abit salty but they were still good. The fries were very good. I will be back to try the other flavors. Fantastic surprise. I ordered the Honey BBQ wings and fries plenty to eat. Excellent flavor, I was very glad I found this truck today. 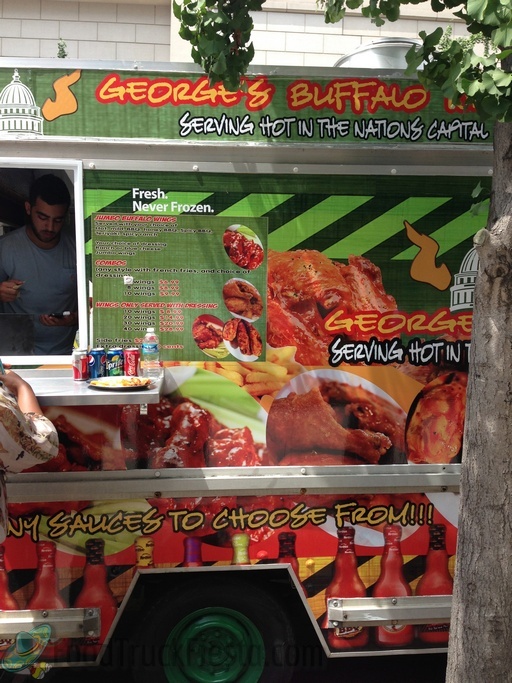 George’s Buffalo Wings DC food truck started serving in August 2013. 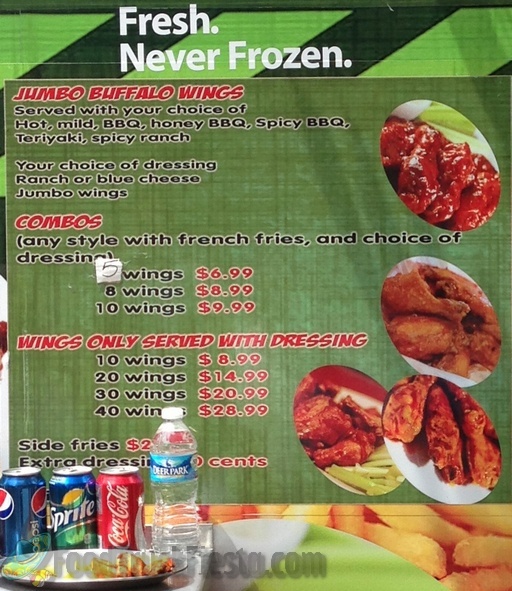 FTF reader, Peter, reports that the wings are good! Thanks to Peter for the following pics!